Wildland fire encompasses numerous interacting and complex social, ecological, and physical factors. Throughout each phase of the Cohesive Strategy effort, simple conceptual models have been used to illustrate how management actions interact with the physical and human-built environment, events, and processes to influence the risk associated with wildland fire. For example, consider the hypothetical case of a single wildfire. Whether a wildfire ignites and how extensively and intensively it burns depends on the interactions of five factors: a source of ignition, available fuels, topography, weather, and suppression response. By itself, the fire is simply an event. It can be described by its location, intensity, duration, extent, or other characteristics, but it has no normative value—it is neither good nor bad. The consequences matter, however, whenever homes and other structures are involved, economically valuable timber is lost, critical wildlife habitat is degraded, or other values are lost depending on the location, extent, and intensity of the wildfire. The conceptual model is completed by adding consequences (value changes) and management options available that might directly affect factors contributing to risk (figure 3.1). For example, a fire prevention program could lessen the probability of human-caused ignitions. Similarly, a fuels treatment program might change fire behavior and make it less damaging or easier to suppress. A third option might be to consider adding firefighting capacity to the local community or management unit so that wildfires are contained before they grow large and damaging. Finally, the likelihood of a wildfire damaging homes or other structures can be reduced by treating the immediate area around the home or near other highly valued resources. 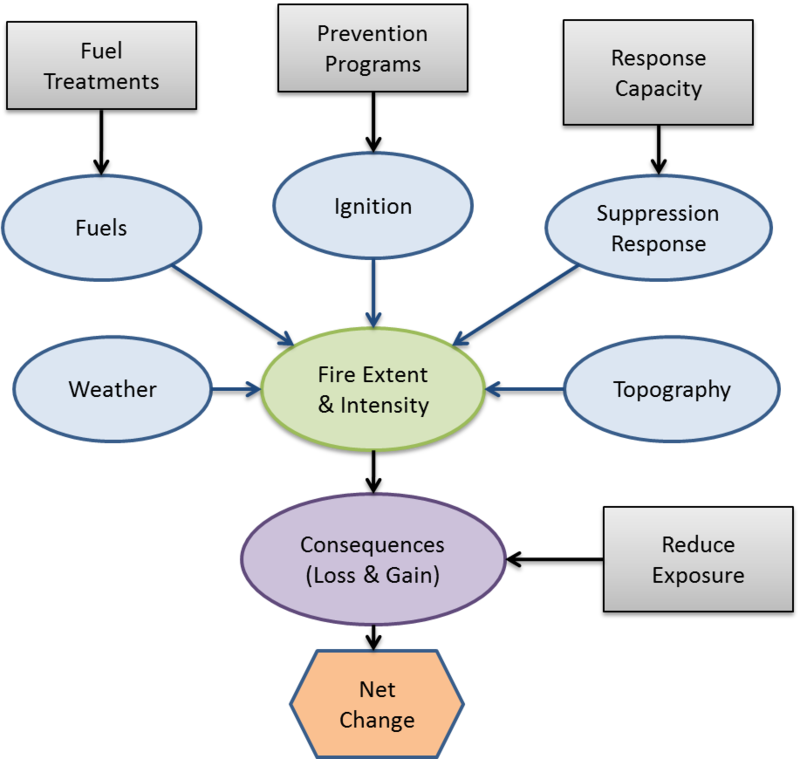 The conceptual model of a single wildfire can also be viewed as a caricature of larger wildland fire challenges. Nationally, five basic factors determine when, where, and how intensely wildfires burn: climate, topography, vegetation, ignitions, and suppression. Of these, two are realistically beyond the influence of wildland fire managers—climate and topography—but cannot be ignored. Management directly influences the remaining three, but they rarely are as straightforward as the conceptual model might suggest. Similarly, mitigating consequences by reducing exposure is often difficult in practice. Understanding the national implications of various policies and actions requires more sophisticated and nuanced exploration of key pathways by which actions lead to desired outcomes. In following sections, the analysis and discussion is organized around four national challenges that basically follow the key pathways suggested in the conceptual model above. These include: Vegetation and Fuels; Homes, Communities, and other Values at Risk; Human-caused Ignitions; and Effective and Efficient Wildfire Response. Table 3.1The variation across the Nation in landscapes and community structure described in the National Characterization section suggests that no two counties are likely to experience identical challenges or respond the same to management options. For example, some areas will respond positively to fuel treatments, while other areas will be more sensitive to greater emphasis on prevention programs. This implies that there are no one-size-fits-all solutions or prescriptions for reducing overall risk. The same can be said of the challenges, where some issues are more or less important, depending upon the circumstances of each region or county. Most of the potential actions previously identified by the RSCs address these four national challenges. Administrative actions that focus primarily on improving overall efficiency by sharing information, personnel, and resources form a fifth class of overarching challenges affecting wildland fire management. 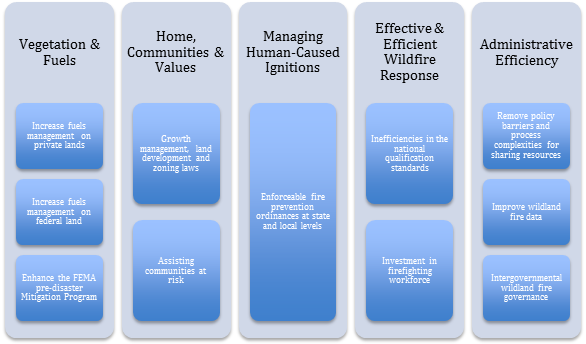 Representatives of the three RSCs also identified specific national priority barriers and critical success factors for improved landscape resiliency, fire-adapted communities, and improved fire response. These barriers or critical success factors align with five general classes of national challenges (table 3.1), consistent with the simple conceptual model (refer to Appendix C in the written report for additional detail on the barriers and success factors). Understanding how investment choices might play out differently across the Nation is critical to being able to plan an efficient and effective national strategy. In the following sections, each of the four national challenges is examined. In this analysis, the focus is shifted from what the Nation wants to achieve—national goals—to what challenges must be overcome and actions taken toward those goals. The analysis seeks to answer three principal questions: (1) Why is this a national issue or challenge? (2) How does the issue vary across the Nation? (3) Where are the greatest opportunities for positively addressing these challenges and mitigating risks? The remainder of this chapter focuses on answering these questions. First, each national challenge is described individually and from an analytical standpoint. Next, opportunities are described through a series of associated management options. A map for each management option displays the spatial distribution of opportunities nationally as well as a brief conclusion related to the management option. Lastly, a summary of all four thematic challenges and opportunities is presented. The options and opportunities inform national and spatially explicit priorities described in The National Strategy. Options and opportunities presented herein are additional useful information to inform land use plans, policies, ordinances, and other applicable guidance, which govern decisions made at national, regional, state, and local scales.